An industry leader offers tools to help you shatter that glass ceiling. It’s been a big year for women in the tech industry. On one hand, it’s easy to see the downside in widespread reports of sexual harassment and all-too-common stories about the gender pay gap. But the very fact that these pitfalls—which any woman technologist will tell you are anything but new — are finally making headlines shows how deeply women are changing the way tech businesses work. But women can’t just sit back and wait for a seat at the table. We need to be proactive advocates for our own advancement in the male-dominated world of startups and tech companies. After all, a lack of upward mobility is a major reason why women leave technology careers, and they leave the industry almost twice as quickly as men. The National Center for Women and Information Technology tells us that women hold only 26% of computing jobs in the United States; the percentages for women of color don’t even crack double digits. And as we move up the chain of command, women’s representation drops from 27% in entry-level positions to just 14% in the executive suite. So what can you do to make sure you’re not one of the statistics? Here are three key tools to help you shatter that persistent glass ceiling. If you want to get ahead — especially in a workplace where you don’t look like the majority — you need to get outside your comfort zone. Whether your goal is to land an overdue promotion or expand your technical skills, embracing opportunity is part of the journey. You can’t be afraid to tackle new tasks or challenges. And you shouldn’t let imperfect qualifications or a lack of experience prevent you from raising your hand. Remember that discomfort is often a good sign that you’re on the right track. And don’t be scared to share your goals openly with your boss and your colleagues. Let people know what you want and need to be successful. Don’t keep your dreams to yourself. When you’re a woman in a male-dominated industry, it’s easy to imagine that your struggles are unique. But many others before you have gone through similar experiences. The trick is finding those people and allowing them to help boost your confidence. If you want to get ahead — especially in a workplace where you don’t look like the majority — you need to get outside your comfort zone. First, seek out other women technologists at your company, either within your department or on a wider scale. 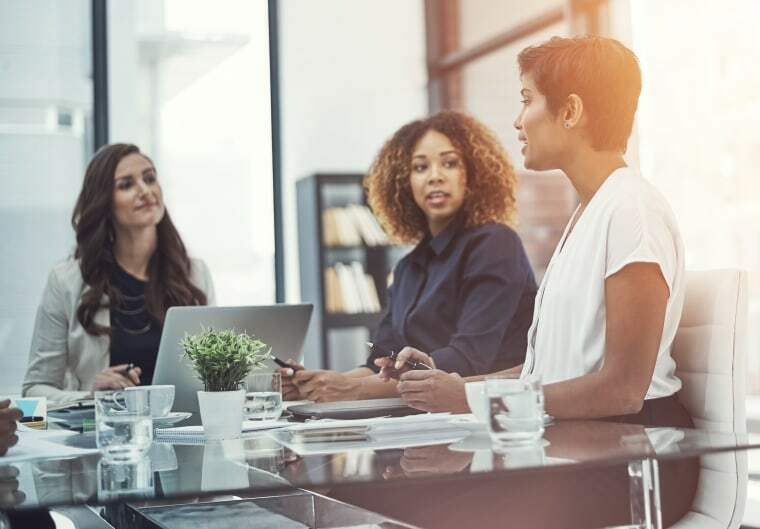 If your employer doesn’t offer an affinity group for women, consider working with management and human resources to create one. (Remember, too, that many male allies are eager to provide guidance and support.) When women see other women making strides toward their goals, they’re better able to believe in themselves. No matter whether you’re a recent graduate or a senior contributor, it’s important for women to see and hear other women stepping up and speaking out. And it’s equally important to pay it forward: If you’re in a leadership position — even an informal one — step up into a mentorship role. It sends a powerful message to all employees on the importance of gender diversity. And countless mentors have told me they get as much out of the relationship as they give, sharing career aspirations with the women they mentor, keeping a fresh perspective and encouraging one other to pursue new opportunities. No matter whether you’re a recent graduate or a senior contributor, it’s important for women to see and hear other women stepping up and speaking out. Once you’ve started on your path, take active steps to keep the momentum going. Engaging with a community of like-minded people is one of the best ways for technologists to stay inspired and move past career roadblocks. Seek out technical women’s groups in your local area, or on the web. The Anita Borg Institute facilitates local communities in 20 major cities around the world, as well as the Systers network, where women discuss issues, explore technologies, and connect online. Other organizations, like Project Include and NCWIT, help teach companies best practices for increasing women’s participation in tech. As computers and technology become even greater forces in our lives and in society, more and more organizations — even those that aren’t traditionally “tech companies” — are hiring computer scientists, engineers and other STEM specialists. And, unsurprisingly, these same organizations are migrating toward tech-company cultural norms, too. So it’s critically important for women technologists to get out in front of this shift and stake our claims. Together we can work toward a future where the people who imagine and build technology better reflect the people and societies that use it. Dr. Telle Whitney is the President and CEO of the Anita Borg Institute for Women and Computing. She cofounded the Grace Hopper Celebration of Women in Computing, and previously held senior technical management positions in the semiconductor industry. Whitney earned her Ph.D. in Computer Science from Caltech, and her bachelor’s degree at the University of Utah. Dr. Telle Whitney is the President and CEO of the Anita Borg Institute for Women and Computing.